The Last Two Kaladesh Inventions Revealed! We now know the final two Inventions to be featured in Aether Revolt! The pair showed up on Reddit yesterday. Feast your eyes on Planar Bridge and Paradox Engine! As of now we don’t have scans of the set versions, though it’s fair to assume that these cards will be featured in regular versions in Aether Revolt. I would also wager that both are mythics giving how unique the effects are. 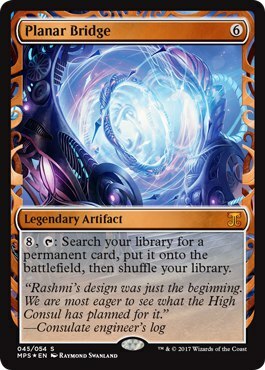 Both cards are likely shoe-ins for Commander play, which will inflate the value of these Inventions, though Planar Bridge doesn’t have the makings of a tournament staple. 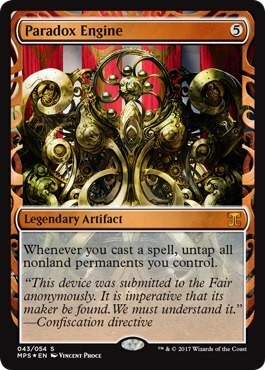 I can imagine Paradox Engine doing busted things with artifact and creature mana, though at five mana it’s far from a guarantee. I’m not terribly excited for the set versions, though these are likely to be two sought-after Inventions.